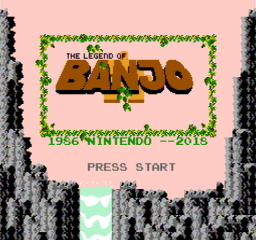 Like the previous reviewer of the game, I didn’t have any “Banjo” experience going into this hack. 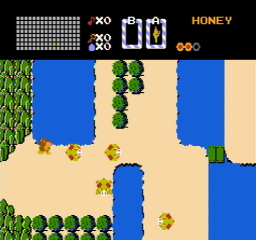 I’ve been watching a lot of LoZ and Zelda II randomizer races and wanted to start trying out some of the hacks we’ve got here and maybe see if I’ve got what it takes to compete (sadly, I think my patience may be lacking). Then I got to dungeon 9 and it destroyed me (and my patience). Holy crap that got hard… quick! Unlike the other reviewer who didn’t seem to think 9 was hard, I ended up doing something I rarely ever do which is try out game genie codes just so I could see the ending. I actually did this because I thought I had done a bad patch job because of the aesthetics of level 9. I won’t ruin them here, but just say that I spoke with Charade in PM and this was how the level was designed to be. 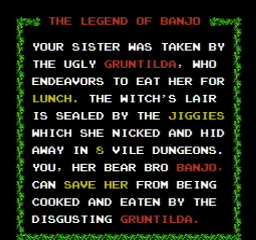 I suggested he should put out an update patch where one of the characters were in the dungeon to tell you something like “Don’t blow on your cartridge. Everything is as planned”. I think it would fit the lighthearted comedy of the rest of this hack rather well and clear up any confusion for those who see that and freak out. Also, unlike the other reviewer, now that I know that 9 played exactly as intended, I have to disagree about level 9 not being well thought out. I thought it was a great “Boss Rush” mode style final level that is somewhat reminiscent of the Mega Man franchise. 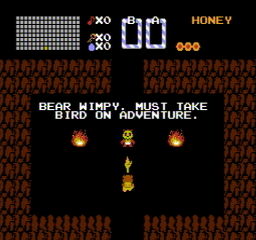 It’s utilized by an entirely unique way for LoZ games to use keys that Charade has going on with this hack. 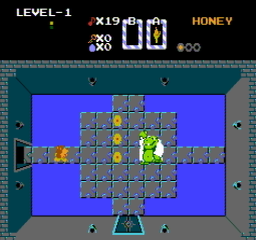 Though I think the difficulty of the hack gets ramped up far too high in the 1st quest’s 9th dungeon, I feel that Charade did a great job here and has a talent for level design that could be an inspiration to other hackers out there.